The shield is made from wood, with a black leather covering on the front, possesses a rich level of decoration, a fine brass boss at the center, ringed by brass studs and rivets all about its circular face. 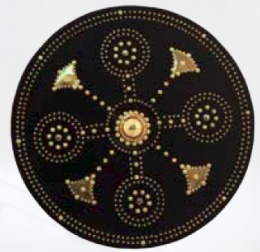 Concentric circles are among the most common shapes on this targe, which recreates one of the two more common patterns that were used in targe design. Slightly smaller than the typical medieval round shield, this targe is slightly larger than is traditional as well, measuring in at a 24 inch diameter. This targe is based on an original, which was "captured" at the BATTLE OF CULLODEN in 1746, and taken south to London with the Jacobite prisoners. It is now in the Museum of the Royal Armouries in The Tower of London. This page was last modified on 18 May 2014, at 18:23.